The technologies complement each other. Regular cameras collect visible light, while infrared cameras detect heat and are unaffected by light, making them ideal for nighttime use, foggy conditions, and dust storms. The system's radar uses radio waves to probe the surrounding environment. "With infrared, you can see and understand more than you would with just visible light," Kambhamettu said. "Then, with radar, you can see objects that differ from their surroundings, buried up to 3-5 inches." 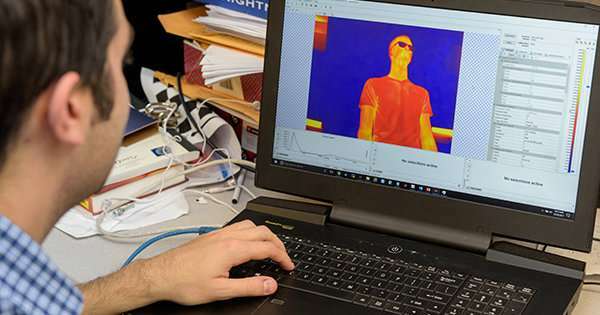 "Some objects that are completely invisible to traditional cameras are easily spotted by the thermal cameras," Saponaro said. The technology being developed in Kambhamettu's lab is tested on vehicles at a military training facility. Kambhamettu and his team will gather data from the cameras, apply deep learning to the data, and develop algorithms to make target detection more effective. 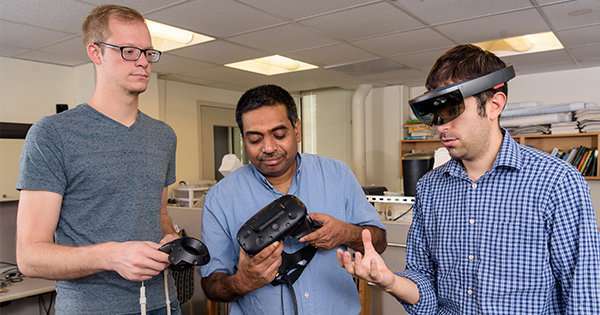 They will also visualize scenarios in a virtual reality environment. The goal: "Take the data, feed it into a computer algorithm and be able to tell whether a target is present or not," said Saponaro. "What we're doing here is useful for day-to-day life, too," said Kambhamettu. Kathy McCoy, the Chair of the Department of Computer and Information Sciences, said, "The cutting-edge work being done in this lab has tremendous potential for significant positive impact. This particular project that involves teaming up with the Army Research Lab and using a creative battery of vision techniques to find IEDs will enable detection that goes far beyond what is currently possible. The consequences to the safety of our soldiers is enormous."